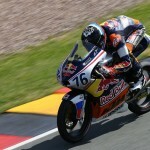 Makar Yurchenko got in Red Bull MotoGP Rookies Cup 4th position on the grid and showed a spectacular fight for Top-5 during 5th and 6th rounds of Rookies Cup championship. Circuit Sachsenring is one of the shortest and most difficult tracks in MotoGP calendar. Russian rookie showed his best result in career having set the 4th fastest qualifying time. 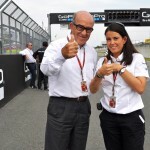 The CEO of Dorna Carmelo Ezpeleta greeted youngsters on the grid before the race. He commented that “it is important the Russian rider shows a good result. Motorcycle sport in Russia is still not enough developed as in other European countries. But this is the question of time. Soon everything is going to be changed”. 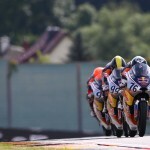 During 5th stage of Red Bull MotoGP Rookies Cup championship Makar Yurchenko got into the fight for the Top-5, in a very tough group of riders. But the technical problems of the bike didn’t let him get closer to the leader. KTM is a bike that is very sensitive to the asphalt temperature and temperature changes can play a bad game with riders. On Friday the setting of the bike seemed to be perfect. But on Saturday, when the sun rose up and the temperature of the track increased, the bike showed unexpected chattering of the front tyre that prevented Yurchenko to set the new limit during the race. He was trying to escape from “a technical trap” during all the race, so he got 10th positionn on the finish line. 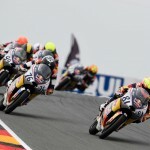 On Sunday, on the 6th round of Red Bull MotoGP Rookies Cup championship Makar Yurchenko again fought for the position in Top-5 in the big group of rookies. On the 10th lap he managed to decrease the gap with Kaito Toba, who was running 5th. But the fight in a tough group didn’t give a chance for a Russian Yurchenko to ask for more than 7th position. On the lap 15 Makar Yurchenko takes a risk to overtake Enzo Boulom and gets a low side fall. He managed to run the bike again and finished the race on the 15th position, with 1 point for the race.